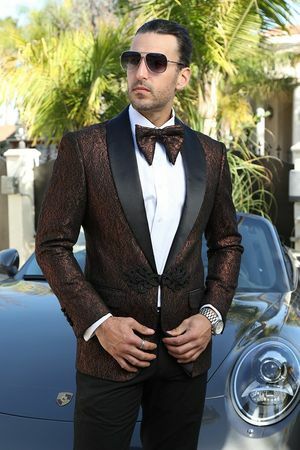 If you like to wear unusual style mens blazers and dinner jackets for a number of reasons, you are the perfect candidate for wearing the unique style blazers from Manzini. Manzini specializes in creating unique style fashion blazers for men that are simply a cut above the rest. This unique fashion blazer features a shiny rust woven fabric with black contrasting lapels and trim in a modern style fit that is more tailored. Includes side vents in the back.